Follow us on Facebook! Follow us on Instagram! Follow us on Pinterest! Follow us on Twitter! Follow us on YouTube! Tired of sweet potatoes? 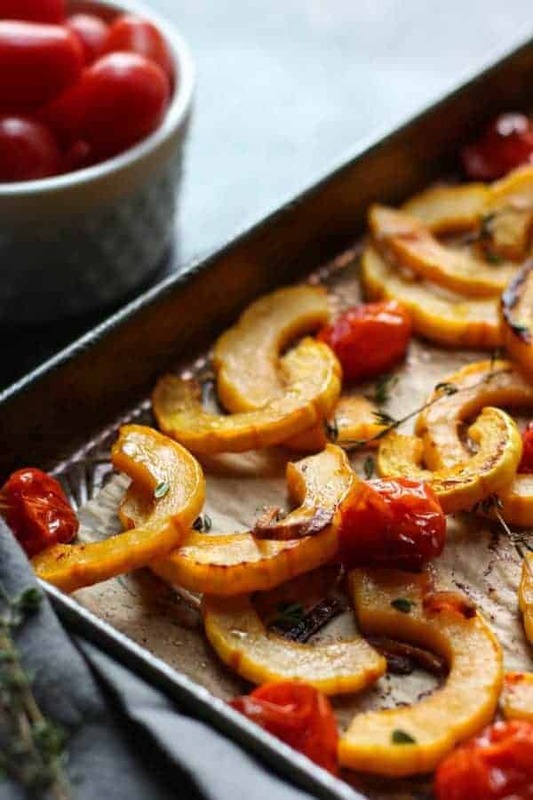 Try this Roasted Delicata Squash with Tomatoes instead for a side dish that won’t disappoint! Being a reformed carb-phobe, I’ve recently rekindled my unabashed love with winter squash. Delicata squash, in particular. I’m utterly smitten with its creamy texture and mild, sweet potato-like taste and the fact that I don’t have to peel it. It’s thin, delicate skin becomes nearly indistinguishable from it’s flesh once roasted which is great for those of us with squash skin-hating kids and spouses (you know, the ones that painstakingly pick every. single. bit of skin off the squash before they dare take a bite). I seriously can’t get enough of this magic squash. It’s so easy to prepare. Just trim the ends off, slice it lengthwise from top to bottom, scoop out the seeds then slice it into thin ‘half moon’ shapes before roasting, steaming or sauteeing. Unlike a butternut squash, there’s relatively little risk of chopping off a finger or missing your cut and sending the squash flying off the counter as you may have done with an oddly shaped acorn squash. As you can see, I’m a bit biased when it comes to delicata squash (but truly, I do love them all). 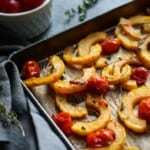 Which is why I’m really excited to share this Roasted Delicata Squash with Tomatoes recipe with you right now. 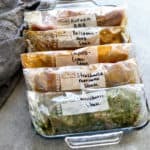 This recipe was born from a ‘happy kitchen accident’ a few years ago when I was trying to use up as much of the garden harvest as I could to avoid having to can/blanch/ferment/dehydrate one more thing because I was so over preserving the harvest with an infant on my hip and a toddler under my feet at the time. Who knew tossing a handful of rogue cherry tomatoes onto a pan of delicata squash and shallots then tossing with with a little ghee and bacon grease would yield such a life-altering dish? Well, it did. 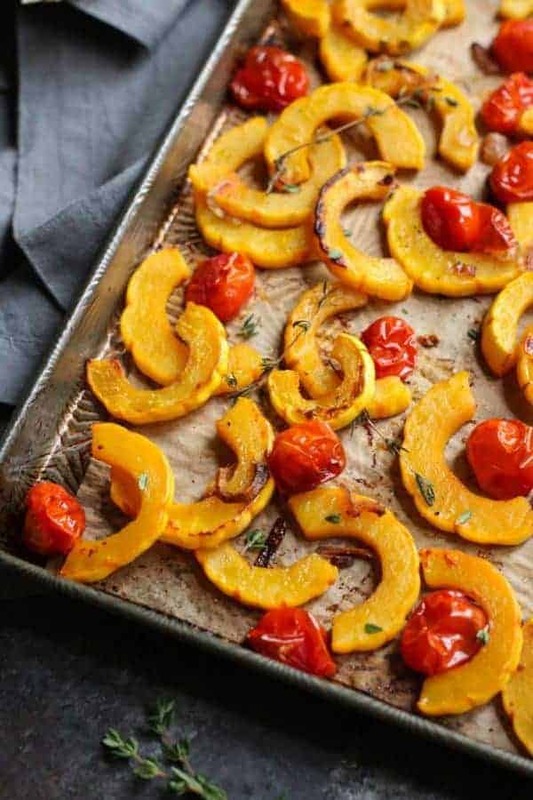 And since that day I’ve been head over heels for this Roasted Delicata Squash and Tomatoes. It shows up on the menu almost weekly once squash start arriving at the market. Since delicata squash is, well, more delicate that other winter squashes you won’t see it in stores or markets much past January or February making it even more special and worthy of almost overdoing when it is available. From day one with this happy little kitchen accident I’ve used shallots in the recipe because I love their subtle onion-garlic flavor – but you can use red onion if that’s what you’ve got available or on hand. I’ve intentionally left any minced garlic out of the dish because with the longer roasting time it burns to a crisp which is why I like shallots. They’re kind of like an aromatic 2-for-1. You can also (or additionally!) 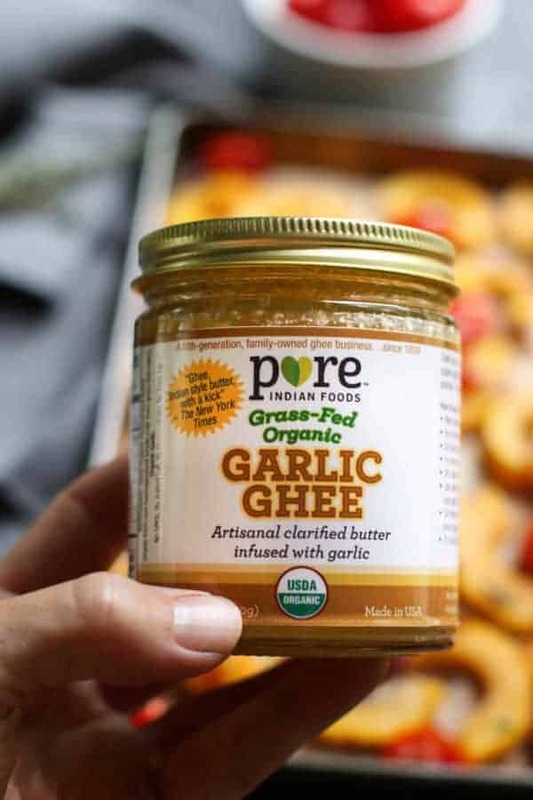 use a garlic-flavored ghee like this one from Pure Indian Foods. It has become one of my favorite fats for roasting and sauteeing and for adding to cooked vegetables before serving. I also love taking it camping because it just makes all the camp fare a little more gourmet without having to worry about mincing garlic by the light of a headlamp while swatting mosquites and trying to keep the ashes from the fire out of my camp mug of wine. 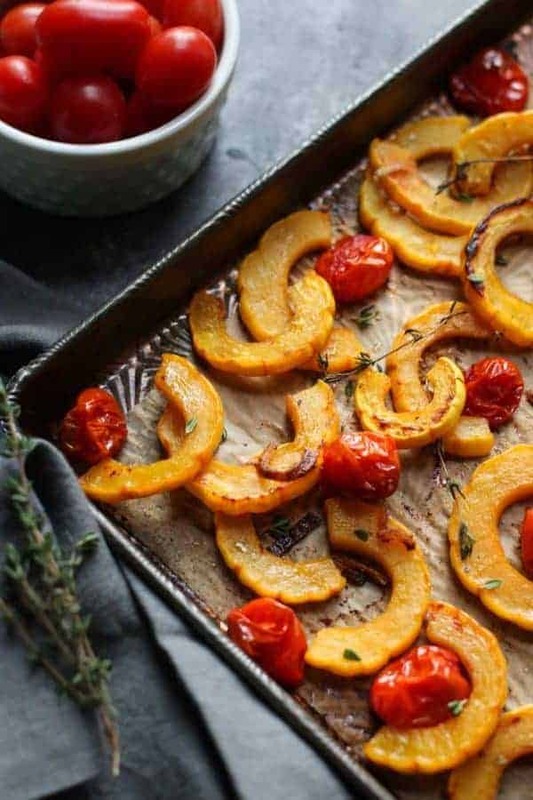 Seriously though, if you’ve never tried delicata squash then this Roasted Delicata Squash with Tomatoes needs to be on your list of recipes to make this fall. So good! Hungry for More? Subscribe to get our newsletter delivered straight to your inbox! And be sure to stay in touch on Facebook, Twitter, Pinterest and Instagram for all of the latest updates. Line a large rimmed baking sheet with parchment paper. 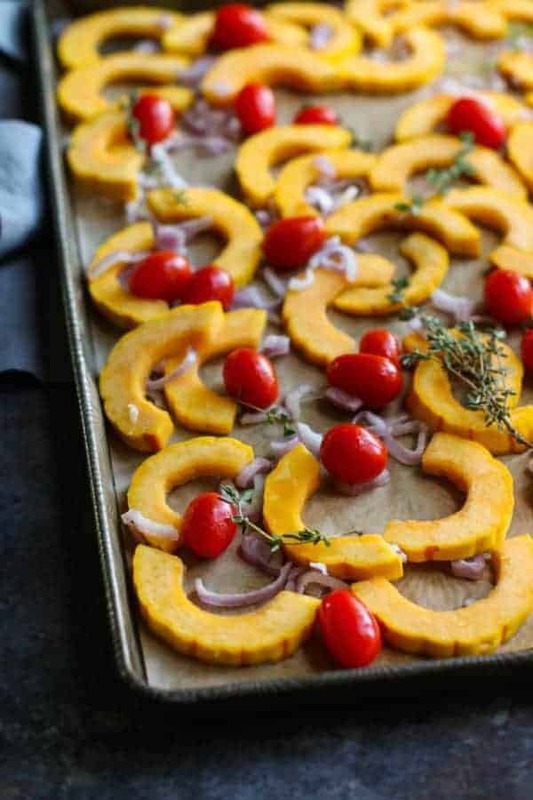 Add squash slices, shallots and tomatoes to baking sheet. Toss with melted ghee (and bacon fat, if using). Arrange vegetables in an single layer. Sprinkle with salt and pepper. 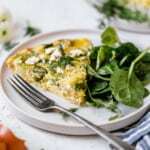 Lay a few thyme sprigs (or sprinkle with dried thyme) on top of the vegetables and bake in preheated oven for 22-25 minutes, stirring the vegetables halfway through baking time, until tender and lightly browned. All photos and content are copyright protected. Please do not use our photos without prior written permission. 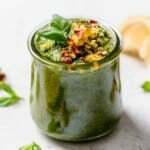 If you wish to republish this recipe, please rewrite the recipe in your own unique words and link back to the source recipe here on The Real Food Dietitians. Thank you! What’s your favorite winter squash and how do you like to prepare it? Share in the comments below! Pin now to make later! This post contains affiliate links, which means we receive a percentage of the sale if you use the link to make your purchase. This does not change the price of the product. This income directly offsets the cost of web hosting and maintenance so we greatly appreciate your support. Jessica is a Registered Dietitian Nutritionist living in Boulder, CO with her hubby and two daughters. She's been described as a 'real food evangelist' and loves sharing her knowledge with others to help them break free of the diet mentality and find their own food freedom. In her spare time she enjoys CrossFit, telemark skiing, mountain biking, teaching herself how to play the banjo and camping out under the stars. I made this yesterday. Certainly was pretty on the table, but next time will be better with a lot more shallots. The caramelized shallots made the while thing come together. 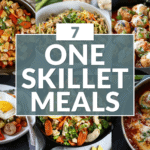 Being a shallot super-fan, I couldn’t agree with you more about adding extra shallots. Looks lovely and I just bought a squash too! My question is what type of pan in the photo did you use? I have never seen a sheet pan with a pattern in/on it. . . .Thanks for posting . . .
Hi! It’s actually a very old pan. Jess’s grandmothers pan. We love it for photos! Any sheet pan will work for this recipe. 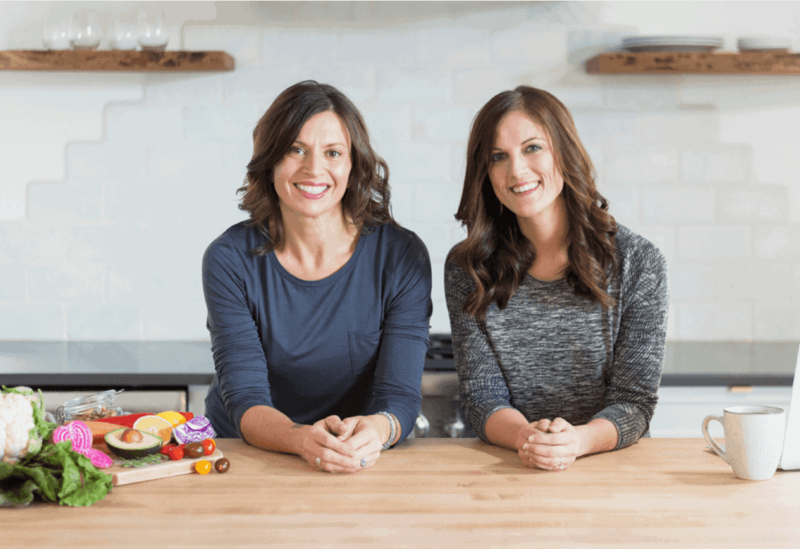 The Real Food Dietitians is the passion-driven product of Registered Dietitian Nutritionists Stacie Hassing and Jessica Beacom. 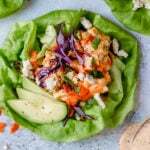 They’ve combined their love of nutrition, health and real food with the concepts of ease and convenience to bring you recipes that are big on flavor but short on ingredients. 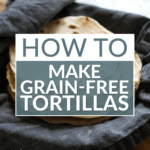 Sign up to get your FREE recipe eBook + weekly newsletter! 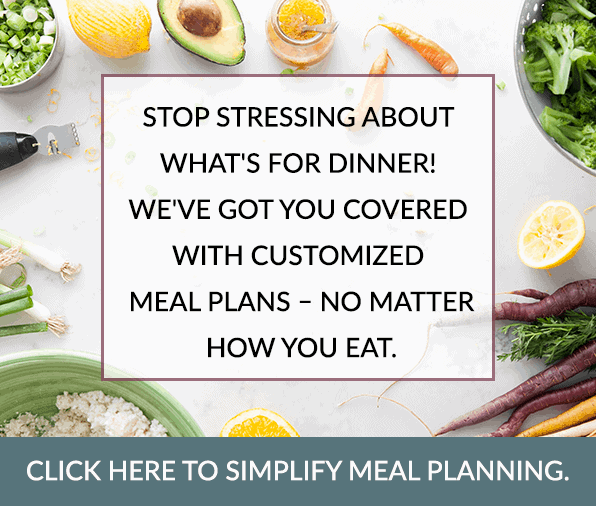 Copyright © 2019 The Real Food Dietitians Site Credits.Designed by Melissa Rose Design. Developed by Once Coupled. 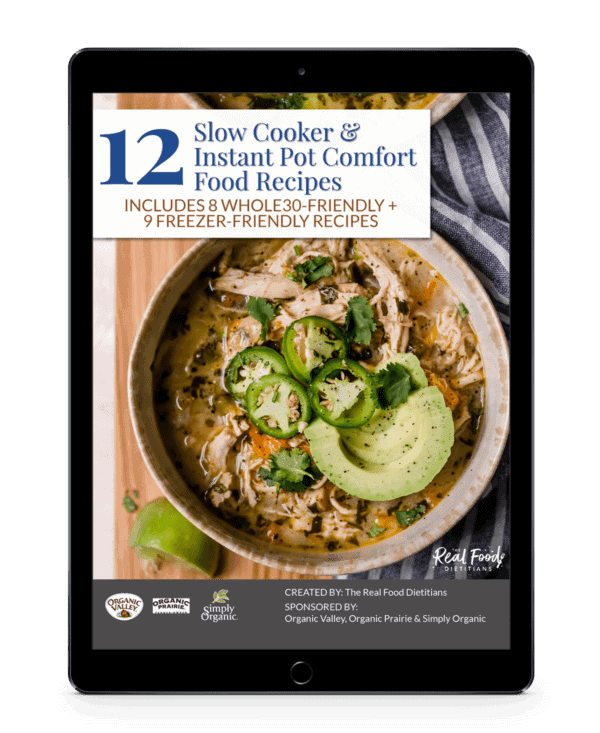 Sign up to get your FREE comfort food recipe ebook! We respect your privacy! Your information will *never* be shared, traded or sold to a 3rd party.